It’s been about six hours since the college basketball bribery scandal broke and in between Twitter jokes and an ominous press conference from the U.S. attorney’s office and FBI, one thing has become very clear: the University of Louisville is in hot water. While UofL was not mentioned by name in the affidavit, interim president Greg Postel confirmed that they are under FBI investigation for their part in the scandal. There are a lot of moving parts to this story, so here’s what we know right now. If any Louisville fans were clinging to the hope that there was another university in the state with an enrollment of 22,000 that could have been the “University-6” mentioned in the affidavit, Postel put those to bed with his statement after lunch. Once you stop laughing at the line “UofL is committed to ethical behavior and adherence to NCAA rules,” let’s go over those alleged violations. 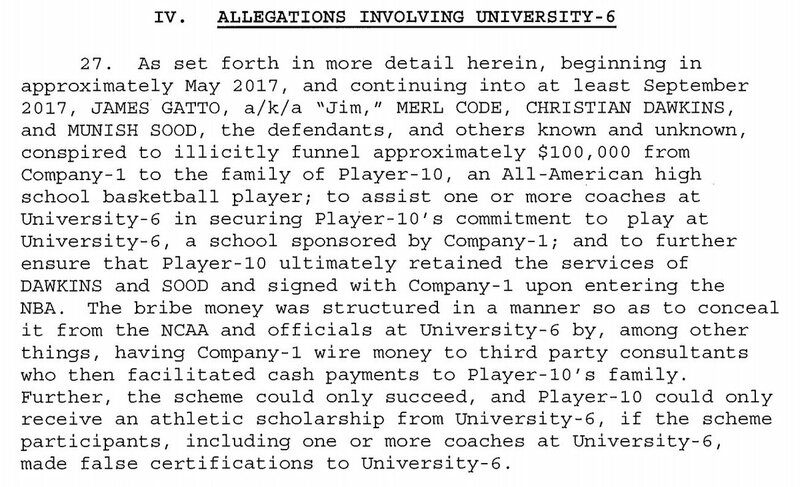 Jim Gatto, the head of global sports marketing for adidas, has been accused of conspiring with others (Merl Code, Christian Dawkins, and Munish Sood) to funnel $100,000 to the family of “Player-10,” a top 2017 recruit, to help two coaches at “University-6” (Louisville) secure his commitment and make sure the player used their services as managers and financial advisors in the NBA. When talking to Terry Meiners about Bowen’s commitment, Rick Pitino acknowledged that it was a surprise and actually said, “we spent zero dollars recruiting” him. Wow. I have a feeling Rick will regret those words. The best part about all of this? The FBI has tapes of all the calls and meetings between Gatto, Dawkins, adidas travel team director Brad Augustine, Code, Sood, the two coaches, and the family. There’s no arguing with the tape! The only 2019 pledge Louisville has right now is 4-star shooting guard David Johnson, who committed to the Cards on September 15. Johnson is only considered a top 35 player, whereas “Player-11” is described as a top ten prospect, so it’s not him. UPDATE: Player-11 is likely five-star center Balsa Koprivica, ranked #7 in the 2019 class. He plays for Brad Augustine’s AAU team, 1 Family, which is sponsored by — you guessed it — adidas. Louisville currently leads Koprivica’s 247 Sports Crystal Ball with 91% of the predictions. I’d be shocked, but it’s Louisville, after all. 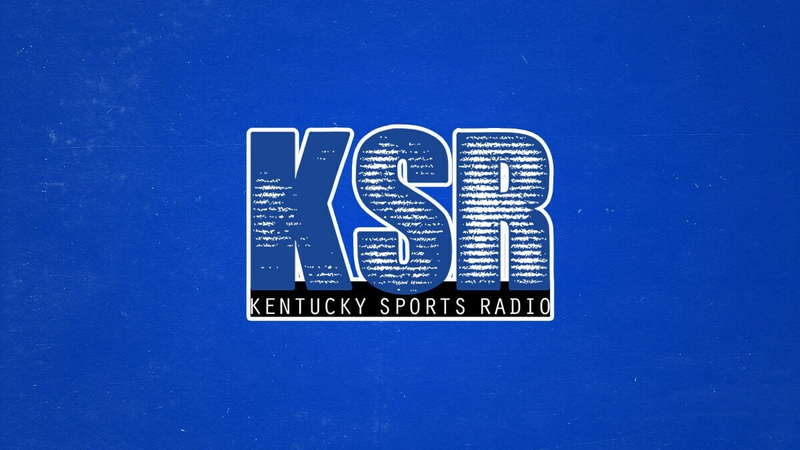 There’s an announcement coming out at 5pm from U of L.
Sure sounds like Pitino and Jurich will be unemployed before I get home today. I mean, technically Rick is right, they didn’t pay any money for Bowen’s commitment. They got Adidas to pay for them. No way. Remember a few years ago when Rick said that he didn’t like it when shoe companies got involved with recruits and they needed to get shoe companies out of the lives of young athletes? He said he would never recruit a kid because of apparel affiliation. Rick wouldn’t lie! If they arrested all of these other coaches and they have all of this information on the Louisville coaches involved, how come they werent arrested also? Did they do it in some sort of different way or is that forthcoming or am I just confused?